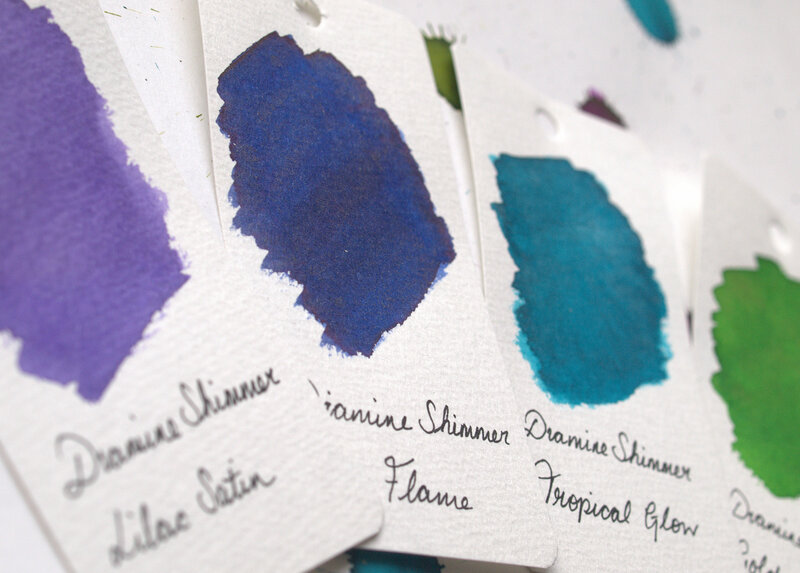 I was excited to receive four bottles of Diamine’s new Shimmertastic inks to review. This is part of a meta-review from United Inkdom. 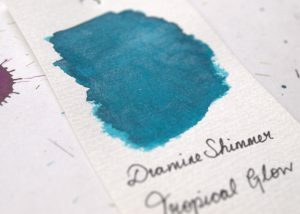 I was particularly happy to get my hands on Tropical Glow, as I love teal and turquoise inks, and Golden Oasis as I am also very fond of this shade of green. This is a mid-green with golden shimmer. It proved to be one of my favourites of this set. 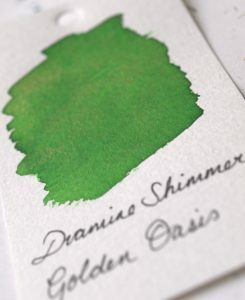 It’s a cheerful, leafy green which isn’t a million miles away from Diamine Meadow. 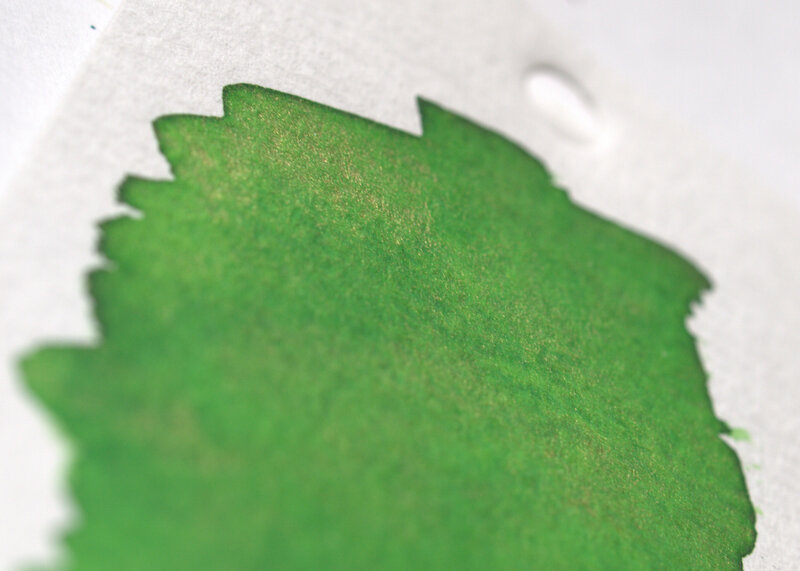 The golden shimmer is subtle but visible. The particles are very fine and a gentle agitation is all that’s required to stir them up if the pen has been lying unused for a while. It’s difficult to capture the sparkle of this ink with a camera, especially in Scotland in late December when there’s not a whole lot of natural light to reflect. This is a beautiful deep turquoise ink with silver sparkle. 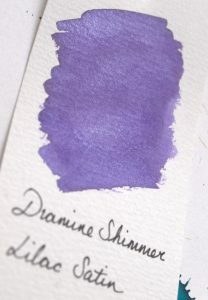 The ink alone is almost identical to Diamine Marine, my favourite every day ink. It’s brighter than Yama Dori and without the amazing sheen of that ink, but as a result is a more usable ink. The silver shimmer, like the gold, is fine but catches the light well. 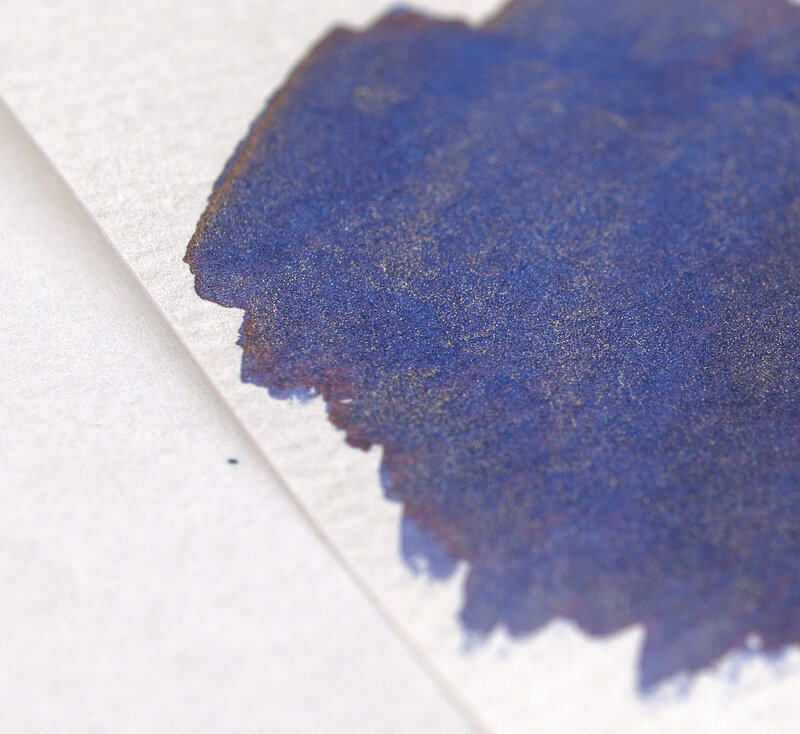 Blue Flame is a deep blue with gold shimmer with a hint of red sheen. 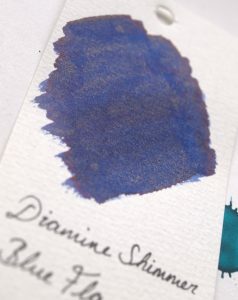 I found it to show the shimmer the best of the four, perhaps because it is the darkest ink and contrasts the sparkle better. 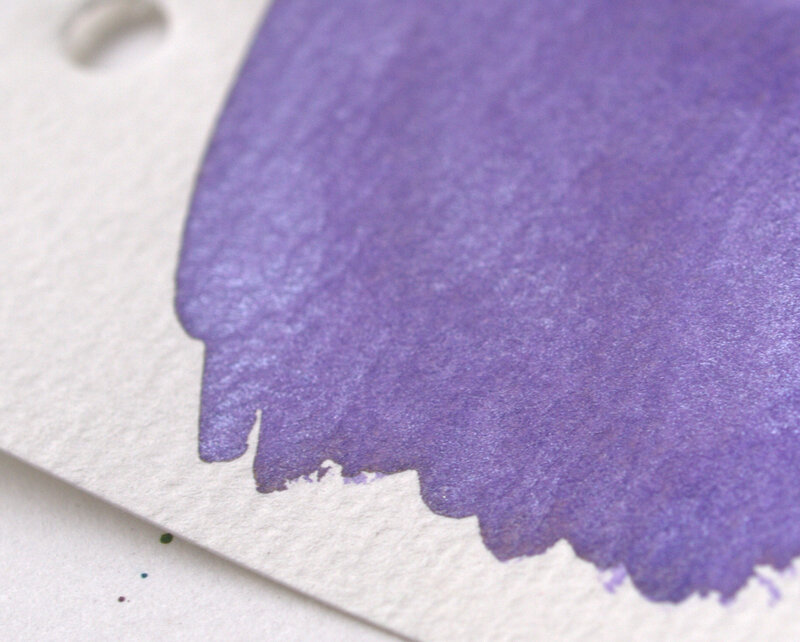 This is a light, bright purple with silver shimmer. I expected to like this more but perhaps it was just that it is too light for me. It is a colour lots of people will love though. 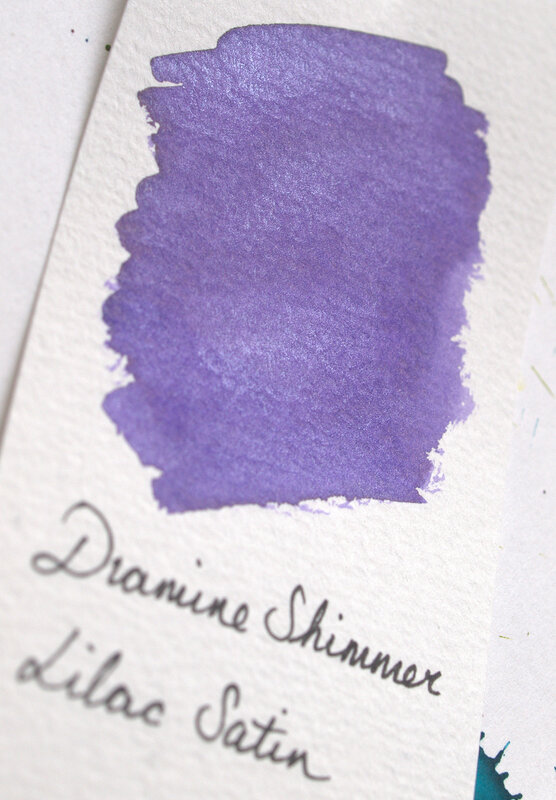 These are lovely inks and I will definitely be investigating some of the other colours in this range. They are not as spectacular as Herbin’s Anniversary inks but they are consequently more usable. 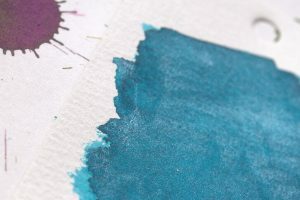 They are affordable for everyday use and the sparkle is subtle enough to brighten up your writing without making it look like there was an explosion in a glitter factory. Only Blue Flame showed any sheet and the shading is minimal on all four.